Within the breadth evinced by music life in Argentina, there were mainly three personalities in the 20th century that gave the republic, independent since 1816, an international voice: Alberto Ginastera, Carlos Gardel und Astor Piazzolla. Whereas Gardel, as a singer and composer, was the most popular representative of the �Tango Argentino� and Piazzolla an outstanding bandoneon player, composer and founder of the �Tango Nuevo�, Alberto Ginastera is considered the most important Argentinian composer of classical stamp. For Ginastera, three periods can be differentiated, clearly delimited in time. In the period of �Objective Nationalism� (1934-47), he employed direct musical elements of Argentinian folk music, including Obertura para el Fausto Criollo op.9 (1943) and the Symphonic Triptych Ollantay op.17, written after his return from the USA (1947). 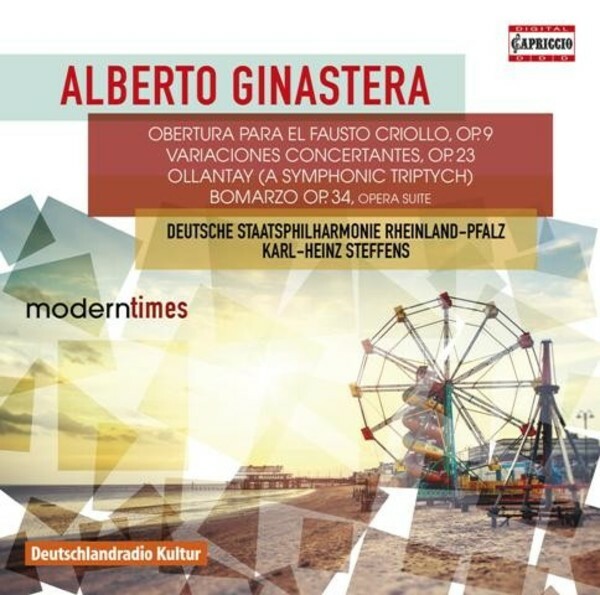 The Variaciones Concertantes for chamber orchestra op.23 (1953) derive from the middle of Ginastera�s second period. Finally, the opera Bomarzo op.34 (1966/67) represents a main work of Ginastera�s third, �Neo-expressionist� period. Although he subsequently made great career strides also in the country of his birth, the external circumstances there remained untenable for Ginastera. In 1971, he moved with his second wife to Geneva, where he died in 1983.